The tree swallows in the sky along the CT River. Some friends and I went on a Tree Swallow Cruise with RiverQuest down the Connecticut River last week and if you can arrange it you have to go. It’s really reasonable ($40 per person) for the time (3-3.5 hours) and what you get to see (half a million to a million tree swallows flying around at dusk). It was incredible, and if you live in Connecticut it is right here for us. So often when I want to see something naturally cool I feel like you have to travel to see it—Mexico for the butterflies, New Zealand for the glowworms, etc. But this is right here. You bring your own drinks and snacks and board the boat by the Goodspeed Opera House. It takes about an hour to travel downriver to Old Saybrook while Mindy and Mark, your hosts, point out all different birds and information about the river along the way. Shortly before sunset the birds start to trickle in—a few at a time, then a few more, than hundreds, then they start pouring in. 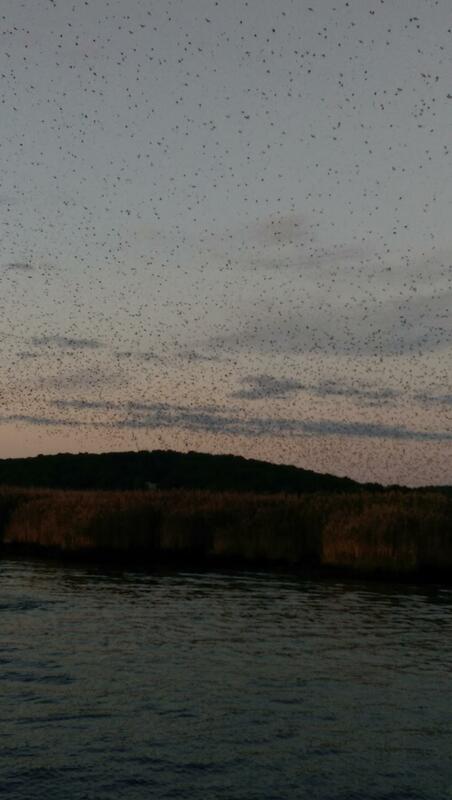 They dance around the sky above the reeds and look like pepper speckling the sky. There are even more that you can’t see with the naked eye. Look through a pair of binoculars and you’ll find that their little white bellies pop out against the green trees behind them. They undulate and wave before they settle into the reeds for the night. And then, as if they are displeased with the sleeping arrangements, they all burst out of the reeds at once and begin to dance again. It’s a beautiful spectacle. 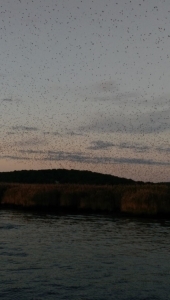 When they decide to go back to the reeds for good, the mass in the sky, funnels downward like a tornado as the birds dive bomb down, flowing down like a stream. It’s incredible. Grab some friends and go if you can. I tried to film some if it with my iphone. At 30-seconds and 1-minute you’ll see them all fly out of the reeds.